TV presenter, TV clown and old boat enthusiast Griff Rhys Jones’ series Rivers this week follows the River Lea. If the Thames is also known as the London River and the Medway is often called London’s Other River, then the Lea must at least claim to be London’s Other Other River. True to the form of the other programmes in the series it included some fabulous photography interspersed with some comical rubbernecking by GRJ and some interesting historical stuff – and I have to say it was easily the most interesting of the series so far. I lived for years on the banks of the Lea and frequently used it to travel around – though by bicycle on the towpath in those days rather than by boat, but the programme makers introduced me to several aspects of the river that I hadn’t known anything about, including the large gunpowder works on its banks and the barges that used to carry the dangerous stuff away. Anyway, the programme included a jolly sequence in which the last remaining gunpowder barge (and incidentally, the last sailing barge to be launched in the heyday of barge building), the Lady of the Lea, came up the river for the first time in a decade, and then had some trouble turning around in the river, which we learned is silting up slowly. There are a couple of links to share one shows a nice photo of the old boat, while the other gives her main details. If you’re in the UK, the River Lea episode will be available on the BBC iPlayer for some days to come. It’s always nice to hear of people’s interest in building one of my designs, and very pleasing too when they go so far as to make a model. So I’m delighted Paul McGuire has made two of the Julie skiff rowing skiff – the first is the standard A4/letter paper size you’d get from a normal domestic printer, and the second he made by blowing the original download up so he could use a bigger piece of card. Thanks Paul! Has anyone else made either a model or the real thing? We’d very much like to hear from you at gmatkin@gmail.com. These boats are designed to be built using the stitch and glue technique – if you haven’t done this before you might be interested in my book Ultrasimple Boat Building: 17 Plywood Boats Anyone Can Build or one of the other books on this topic available from Amazon . 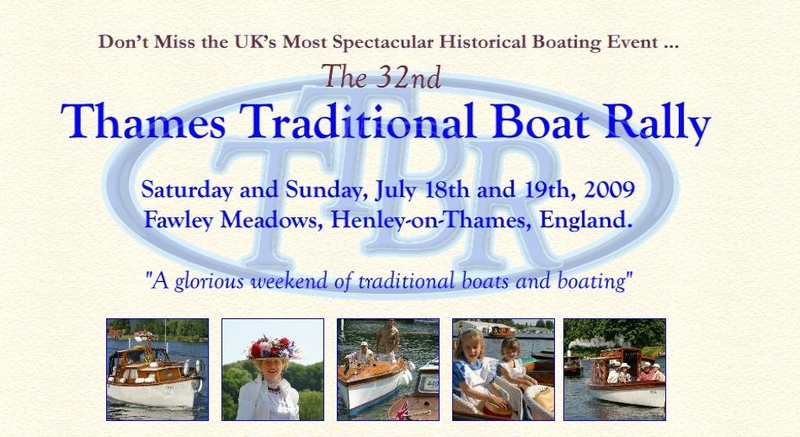 I won’t be able to make the Thames Traditional Boat Rally this weekend but I’d like to make it one day – and no doubt Julie would love what looks like a rather genteel event. In the meantime, I’ve been enjoying this fabulous gallery of photos. I recommend you just hit the ‘play’ button at the top right of the page and watch the boats go by for a few minutes.